Deal: Grab the Oculus Rift, Touch wireless controller, and EVE: Valkyrie for 33% off at Best Buy! Looking to enter the trendy VR niche? Well, if that's the case, you might be happy to know that Oculus has decided to put its Rift headset and Touch wireless controller bundle on sale. The manufacturer is offering the set for $399, a 33% discount compared to the price tag that the device was carrying barely a few days ago. While you will find a similar discount for the bundle at Amazon and other retailers, Best Buy seems to be one of the few places that are also throwing in a free game to further sweeten the pot. If you choose to buy the set through the consumer electronics chain, you will also receive a copy of EVE: Valkyrie free of charge. Additionally, purchasing the bundle will get you the usual pack of 7 free games, including Lucky's Tale, Medium, Toybox, Quill, Dead and Buried, Dragon Front and Robo Recall. It's important to note that Oculus Rift isn't compatible with mobile devices and you will need a gaming PC to be able to use the headset. The minimum specifications required to run the device can be seen below. If this deal arouses your interest, feel free to follow the above link to Best Buy. 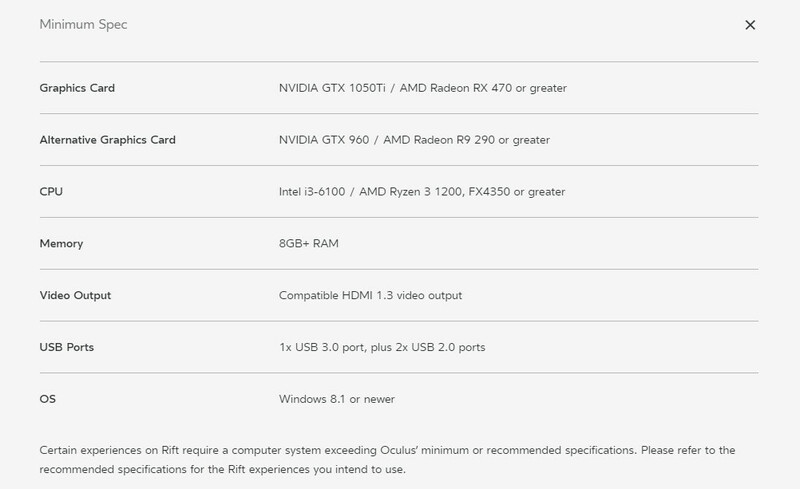 Check if your PC is compatible with Oculus Rift by scrolling down to "Recommended PC Specification"
I purchased HTC Vive and later realized that I can't use it with my $1500 Surface Book. They told me it requires special hardware specs. My question is that can I purchase the Rift to use it with my current laptop or I should do the same thing with the Vive? Neither will work with your laptop, mostly because it doesn't have a dedicated graphics card.